During the period of the Revolution, two companies were formed from this church. The first one, formed Sept. 20, 1775, was the first company of minutemen in Salem County. This company under the leadership of Captain Jacob DuBois was home guard duty repelling the British out of Philadelphia. The other company was formed by Captain Cornelius Nieukirk, and it saw considerable action. It helped General (Mad) Anthony Wayne drive the Salem County cattle to General Washington at Valley Forge in 1777-78 and saw considerable action in the Battle of Brandywine, and at Mount Holly. while they were being tried by patriotic courts. 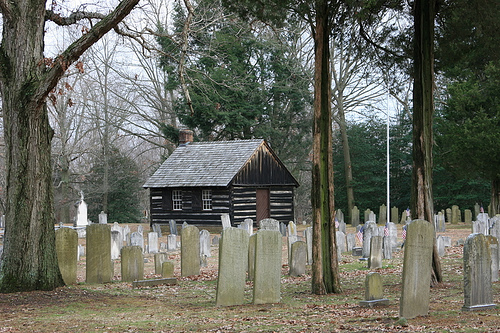 VETERANS OF THE REVOLUTIONARY WAR BURIED IN THE OLD PITTSGROVE PRESBYTERIAN CEMETERY, DARETOWN, N.J.
Thomas Banks (died Feb. 23, 1825, age 65) enlisted in Va. Reg. Samuel DuBois (died Jan. 8, 1811, age 69) Brother of Capt. Peter DuBois. Eleazor Mayhew, Esq. (died Nov. 17, 1828) Capt. Nieukirk’s Batt. 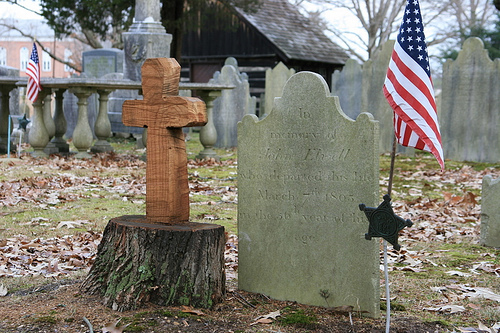 John Nealy, Private (died March 7, 1795, age 50) Capt. Nieukirk’s 2nd Batt.